Hello there! I’m super excited to be the Newton’s Nook Guest Designer for the month of February. Huge thanks to the Newton’s Nook family for inviting me. As we are in the month of love, here I’m sharing a lovely Valentine’s Day card featuring Newton and his sweetheart from the newly released Newton’s Sweetheart stamp set. I love the images and cute sentiments on this stamp set. They are super adorable and perfect for the theme of love. For this card, I made the background using the bokeh technique (photography term) with distress inks. I used three colors, Peacock Feathers, Cracked Pistachio and Shaded Lilac. First, I blended the distress inks using the blending tool and colored the card completely. 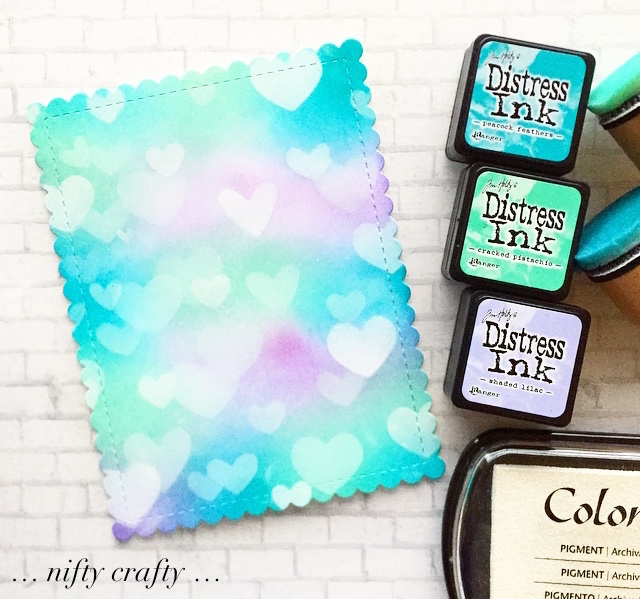 Then, I used the Tumbling Hearts Stencil and white pigment ink to create the bokeh effects. I gently dabbed the white ink on to the different sizes of hearts using sponge dauber. I made some lighter and blurry. I overlapped some of them and make it little darker. I did it randomly all over the card and let it dry. This is such a fun technique and I love how it turned out. Then, I cut it out with a scalloped edge die from the Frames & Flags Die Set. Once I’m done with the background card, I stamped the image of kitties on a TimHoltz distress watercolor card stock and colored them using distress inks. I cut them out using the coordinating Newton’s Sweetheart Die Set. I adhered the image onto the background card and stamped on the sentiment from the Newton’s Sweetheart Stamp Set. Next, I adhered the final background card to the base card and finished off by adding some teal dimensional dots. That's all for today :) I hope you like this card! Thanks for stopping by! Have a great week ahead and I’ll catch you on next Monday with another card. This is so gorgeous! I absolutely LOVE that bokeh background! Thank you so much for being our Guest!! Crafting is one of the things that I love to do the most, I love the thought of making something special and precious on my own and gifting it to others. Nifty Crafty is a little corner which showcases the collection of craft work that I have done. Thanks for stopping by my craft corner! I'm Feline Good with you! Love you more than naps!